Little Ryleigh was born one day before my Michael and Ryleigh’s Mom Valerie and I went through baby classes together before we ended up in the hospital at the same time with our little ones. They have become great friends and enjoy spending time together when we can find the time! I was really excited to be able to make Ryleigh’s cake and Valerie chose this design when I gave her the option. I worked on this cake for most of the week before the party and I was very happy with the result! 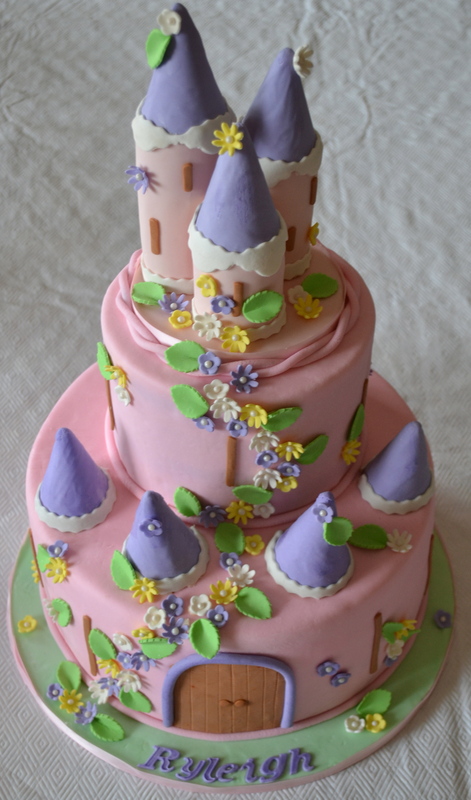 I made about 100 gumpaste flower and leaf pieces and then went on to make the turrets. Most of the pieces were made from gumpaste or a gumpaste and fondant combination. I find that sometimes a gumpaste fondant combination will not crack and is the perfect consistency for things that you aren’t going to eat but you want to add to the cake. The topper was removable and sitting on a piece of foam core board that I covered in fondant and then added the columns and turrets. The columns were a gumpaste and fondant combination that I wrapped around PVC pipe that was covered in plastic wrap and then let them dry overnight. It wasn’t the easiest thing I have ever done to be honest. The biggest lesson learned is that pink fondant (I used wilton gel coloring and maybe that was my problem) looses it color so easily. So be careful if you are trying to match different parts of the cake when you make some pieces before others. The cake inside was banana with cream cheese filling on the bottom and red velvet with cream cheese filling on the top. Both cakes were covered in a vanilla buttercream and topped with my homemade marshmallow fondant.